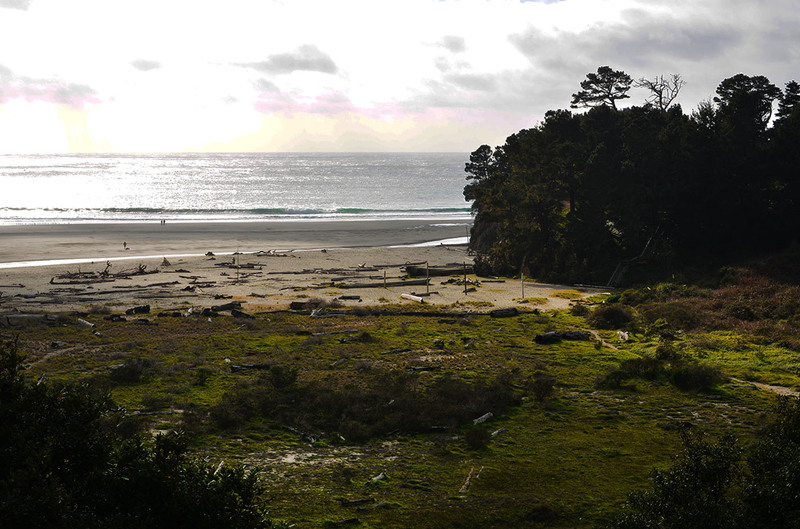 When I first heard the name Mendocino it seemed like a perfect name for a song title. I could imagine a little soulful ditty or a number one pop hit with smooth lyrics describing this remarkable town. My curiosity got the best of me and I looked it up on Google and sure enough there were songs written about Mendocino. Nothing of course matched the popularity of blockbuster hits such as, “I Left my Heart in San Francisco” or “Do you Know the Way to San Jose,” however, I was pleasantly surprised that at least there was a song. After visiting the amazingly picturesque town of Mendocino , it actually did inspire me to compose something that could possibly be sung by generations to come just like the two blockbusters I mentioned above. With inspiration in my soul and a song in my heart, I unfortunately discovered that apparently you have to have a little something called musical talent to actually create a song. Imagine that? Oh well, I guess I will put aside the soul and the song for the moment and do what I can do…write about it. 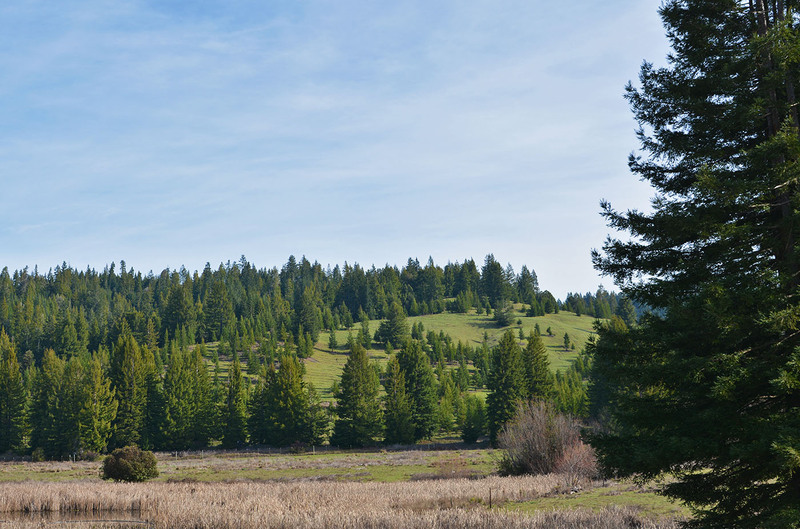 So with musical inspiration, I give you… Mendocino. Here at Staycations California, we like to include places and activities in all parts of California and not just the more populated Southern region. In researching Northern California I saw an article about the Mendocino Wine Festival which was coming up in a few weeks. The story also featured photos which amazed and impressed me on how breathtaking it appeared with its rugged coastline, the sea cliffs, the bay, the quaint village, and the green landscape full of redwoods. It was then and there that I decided I had to go. All I had to do was find out exactly where it was and how to get there. Three weeks later on a Weds afternoon I am off to Mendocino. Our accommodations were in Fort Bragg which is about 10 miles away, but we knew we were close enough to drive over to Mendocino very quickly. This turned out to be true because there are very few traffic lights between Fort Bragg and Mendocino and the view is so beautiful it takes away all your sense of time. That amazing view consisted of chiseled bluffs, rock formations off the coast, empty beaches, and of course the ocean itself. It’s unlike Southern California where there is a traffic light every 50 feet and the view consists of the car beside you and a donut shop or 7-Eleven on the corner. Getting to Mendocino from San Diego is another matter. In reality, if you do know the way to San Jose, you are at least headed in the right direction. 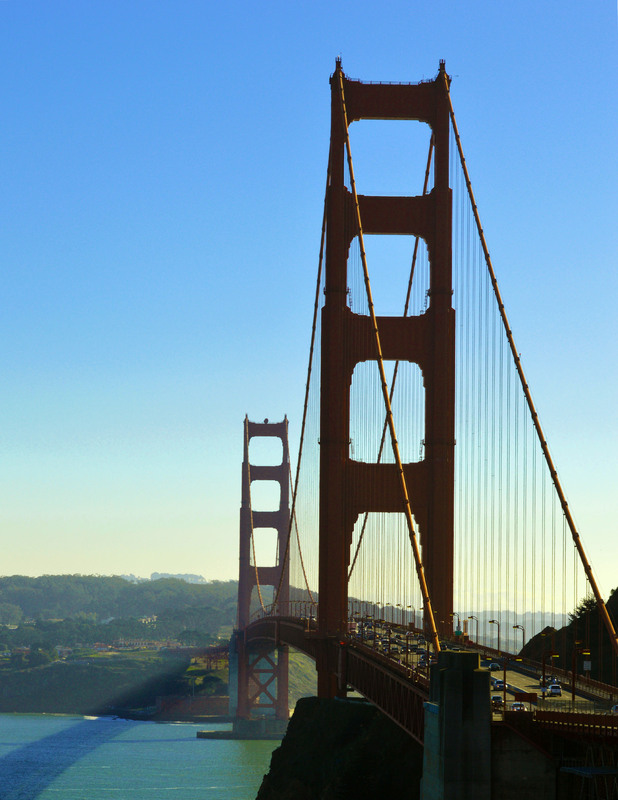 As we drove through the bay area and into San Francisco, we were excited to discover that we would soon be crossing over the majestic Golden Gate Bridge. We stopped briefly at a vista point on the Sausalito side to take some snaps of the bridge as well as the sprawling skyscrapers across the San Francisco Bay. 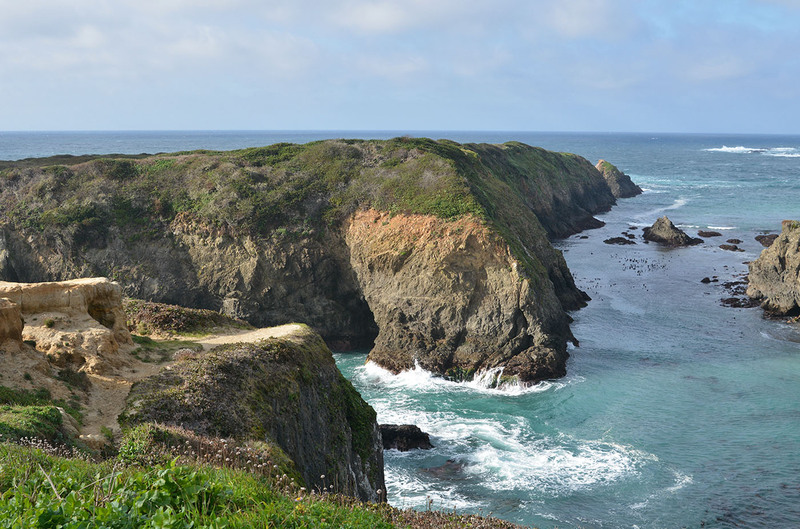 Mendocino is situated on the coast about 150 miles north of San Francisco. 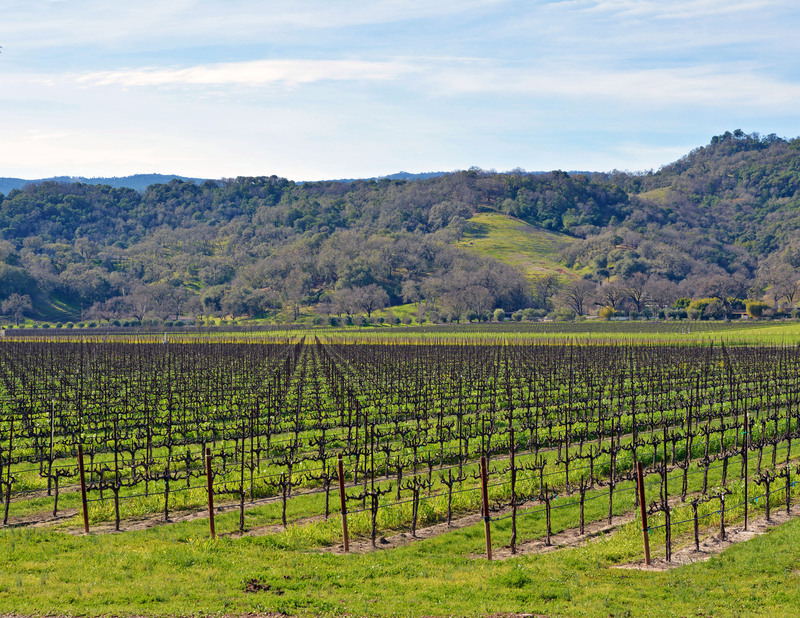 Once you leave Highway 101 and head west, you begin the hour-or- so drive on winding roads that take you through the redwoods and the local wineries. Along the way there are at least 5 tasting rooms so you can stop and sample the local wine, but keep it to a few grapes as the roads on the way are tight and dark. The redwoods cover the sky even when the sun is out. The sun was rapidly setting and we were anxious to get to the coast to catch what we hoped was going to be an impressive sunset. No such luck as these roads would only let you drive so fast. When we did finally reach the end of the road, the sun was long gone and all that was left was a small sliver of blue twilight sky on the horizon. Fortunately it was just enough light for us to get our first glimpse of the coast. Mendocino was all it was cracked up to be and was just as stunning as the photos I saw on Google many weeks before. 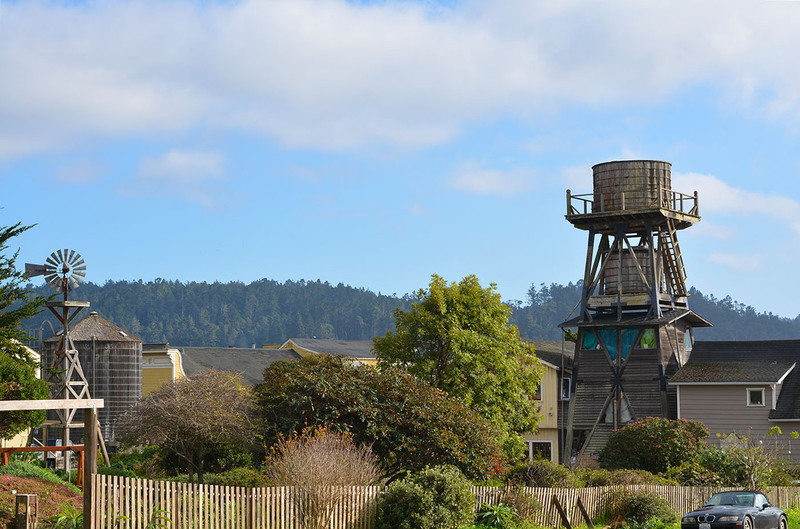 Perched on a bluff overlooking the river and the Mendocino Bay, sits the part of town that caters to vacationers and visitors. 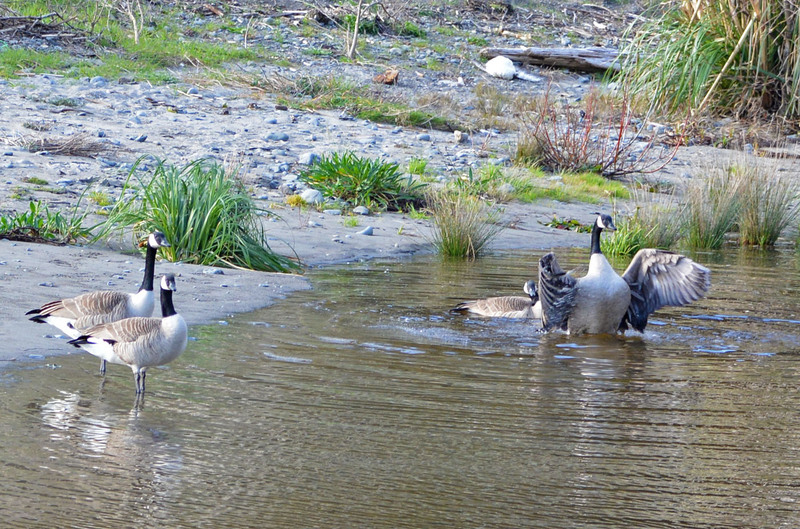 This area features quaint little shops, trendy boutiques, art galleries, bars, and restaurants. 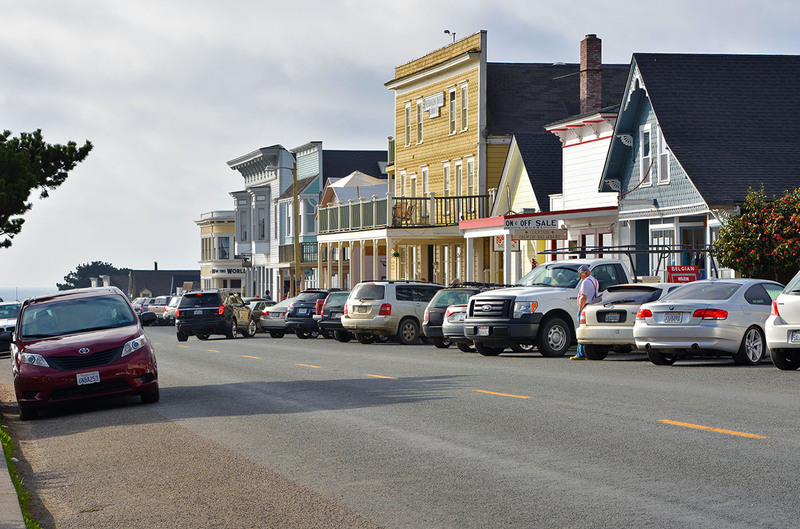 The pastel colors of the buildings bring a Cape Cod or coastal Maine feeling to the town. 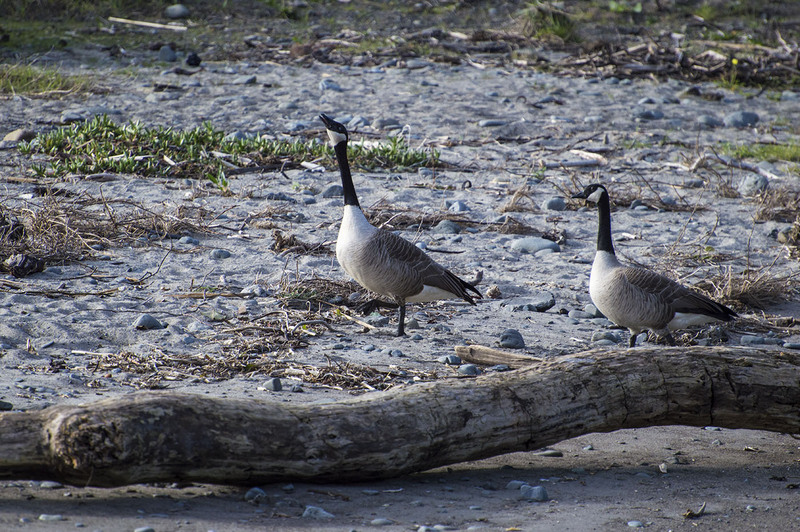 The bay featured a long empty beach covered with driftwood, pristine sand, and a few Canadian Geese grooming themselves in the river. In the water a lone surfer braved the medium sized waves on this crisp January day. 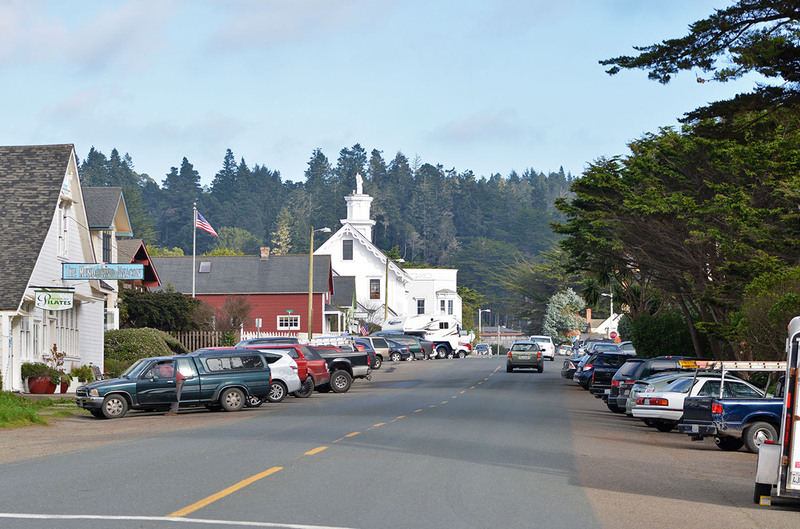 In 1971 Mendocino was placed on the National Register of Historic Places so the residential part of town is rich in Victorian architecture and history. Also scattered about are old or restored water towers and windmills with one such water tower now serving as a hotel for visitors. Early settlers used the towers to supply themselves with water from the nearby river and most have been refurbished to add to the city’s historical charm. In parts of the town, you feel like you are back in the early 1900’s and parts are every bit 2015, though both eras blend nicely together. 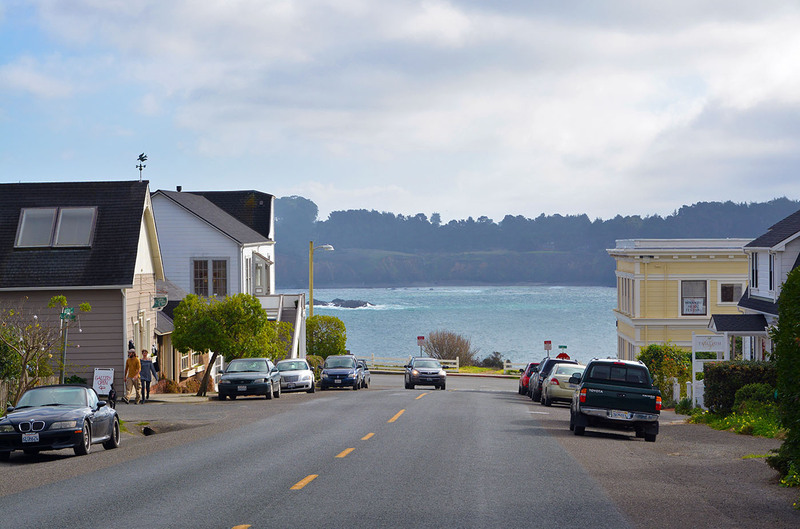 The views in Mendocino are magnificent and while standing on some of the streets you can see all the way down to the bay. Take a drive outside of town and enjoy the gorgeous coastline and breathe in the salt air and negative ions coming from the sea. On any given day in the whale migration, head for a hillside bluff and you will see at least one or two of these wonderful mammals heading south. The pace is obviously slower here and the lack of traffic lights makes it easy to get around. I had to acclimate when I came back home to Southern California where it seemed like every light was at least 10 minutes long. 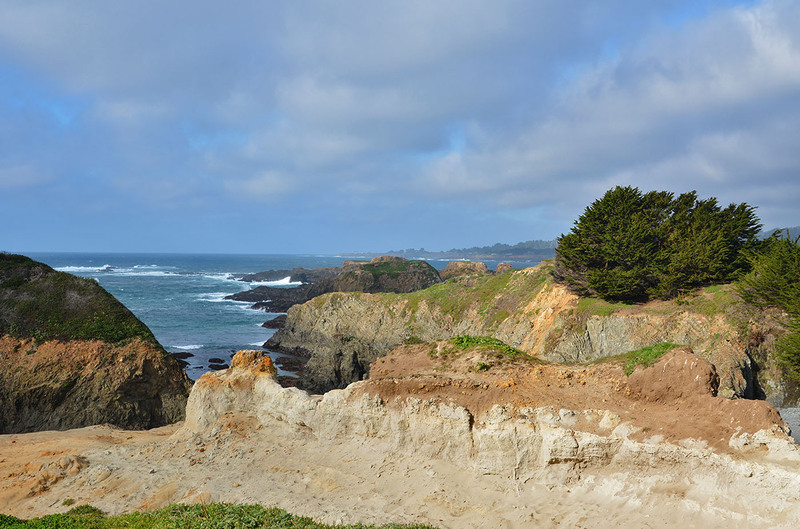 Don’t get me wrong… I love my So Cal, but Mendocino is so worth the 12-hour drive. Yes, 12 hours and don’t even ask me how to get there by airplane. Split it up and stay in Morro Bay one night like we did and make the second half of the drive the next day. Honestly, I could live there but I am not ready for that quiet of a life. For now San Diego County is for me. I did however leave a piece of myself back there… my heart. I know that sounds really, really corny, but it is true. Traveling back on I-5 it didn’t take as long as when we drove up and, obviously it was not as scenic. Leaving the redwoods on our way to I-5 we were brought back to reality once we said goodbye to our last vineyard. 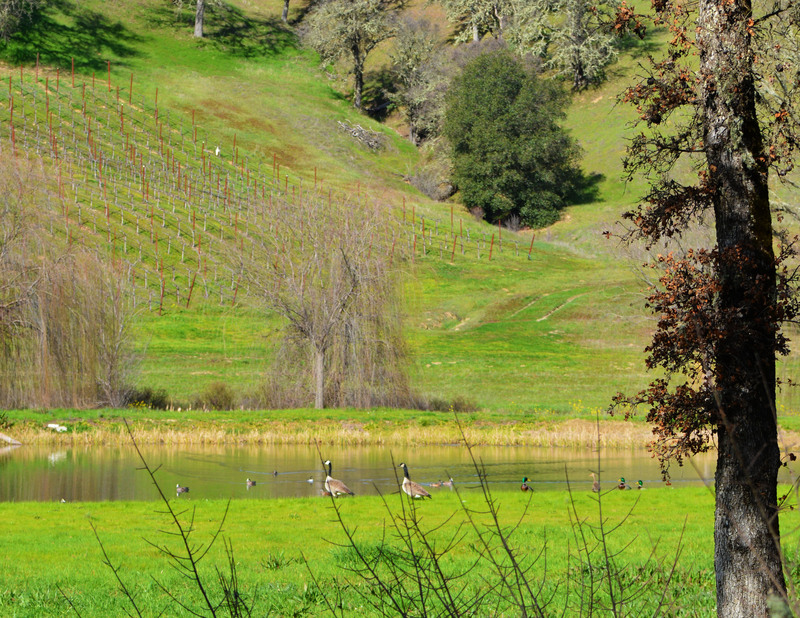 I had to pull over a few times to take a photo and was amazed by the beauty of this part of the wine country. It made me wish that I liked wine so I could taste all the wonderful flavors from each and every tasting room. Maybe not such a good idea, since I was the driver. Onward we drove with a book on tape in the CD player and the dogs fast asleep in the backseat. We hunkered down for the long drive with hopefully an excellent narrator reciting the words from an equally excellent author. With memories of this magical place in Northern California etched forever in our brains, we were hoping the drive wouldn’t seem so long. The truth is, it WAS long, but well worth it!!!! !